As the bands skills improved it became clear that Lawrence was falling behind the rest of the members so in 1978 I [Steve Jaymes-Wright] was drafted in on bass guitar. Shortly afterwards the band played it's first gig at Chessington Rugby Club. Thanks to a quite aggressive poster campaign by the band the gig was very well attended and this was the beginning of Ack Ack's strong local fan base. Mark Williams - Vocals, Mick Foley - Guitar, Johnny Fuller - Lead guitar, Steve Jaymes-Wright - Bass, Stuart Russell - Drums. In early 1979 the band recorded a five track demo tape at Spaceward Studios in Cambridge. Copies of the demo were used to secure gigs at some of the more prestigious venues around London such as The Pegasus in Stoke Newington and The Starlight Club in Hampstead. It was also passed on to former Elmer Gantry's Velvet Opera guitarist Paul Brett. Brett became the band's manager later that year. Many gigs, both local and in or around London, followed both as main act or support act to more established bands such as The Adverts and The Specials. In 1980 work began on recording the band's debut album 'Trouser Tricks'. It was recorded over a six day period at TW Music Studio's, a small studio on the Fulham Palace Road near Hammersmith, W. London. "To truly appreciate the greatness of Ack Ack, you have to understand the culture of the time. Pitch battles were fought between people depending on their choice of hairstyle or - for that matter - trouser style, so eloquently captured in the lyric of "Trouser Trick." Skinheads vs. punks vs. rockers vs. mods vs. hippy types -- it was a gang nightmare. Looking back, the irony is that we were all united in the same hatred: that of the Thatcher regime. Instead of throwing our anger into a strong political movement, it was warfare on the streets outside every bar on any given night. I fell into no category. Neither did Ack Ack. The fact that a mixture of all sub-cultures and all ages gathered at each gig says a lot for the music. 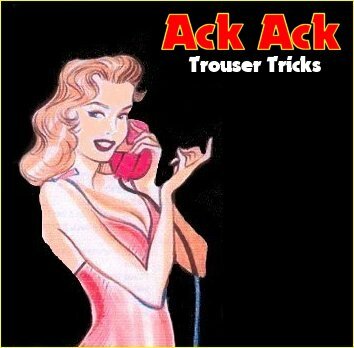 A mixture of punk, new wave, ska and who knows what else, with witty and wise lyrics and great melodic tunes...Ack Ack would rock the place!" "Ack Ack were in my opinion, one of the best bands around in the late 70's. We came so close to a deal with Steve Blacknell who was A&R manager with Orange Records at the time, but unfortunalely, Orange themselves went out of business. They were great live and a pleasure to work in the studio with. Even today, the collection of tracks we produced at the infamous TW Music Studios in Fulham, stand out strong and transcend the years. They come accross as vibrant as ever. The band had an original style of playing and writing and I still think that their frontman Mark Williams had the right image to project the band into a far higher status. Still, I'm glad that Steve Jaymes-Wright has seen fit to feature the songs we set to history. Download them and judge for yourselves "